There have been quite a few [rattlesnakes] this year. I have killed six at my place out on FM 1466. The largest was five feet long, which I killed in April 2015. I have attached its photo. It had 12-13 rattles. I have also killed three of them between 3-4 feet long. My barn cats have killed three babies 12-18 inches long. We’ve been out here for almost eight years now. In the first 6 years, we saw only one rattlesnake. But now in the last six months, there have been a half dozen of them. This entry was posted in Nature, What's New? and tagged Coupland Texas, rattlesnakes on April 24, 2015 by Stewart Dale Spencer. My wife and have been living east of Coupland on CR 463 for the past 14 years and we get at least one rattlesnake every year. I’ve already had two this year. 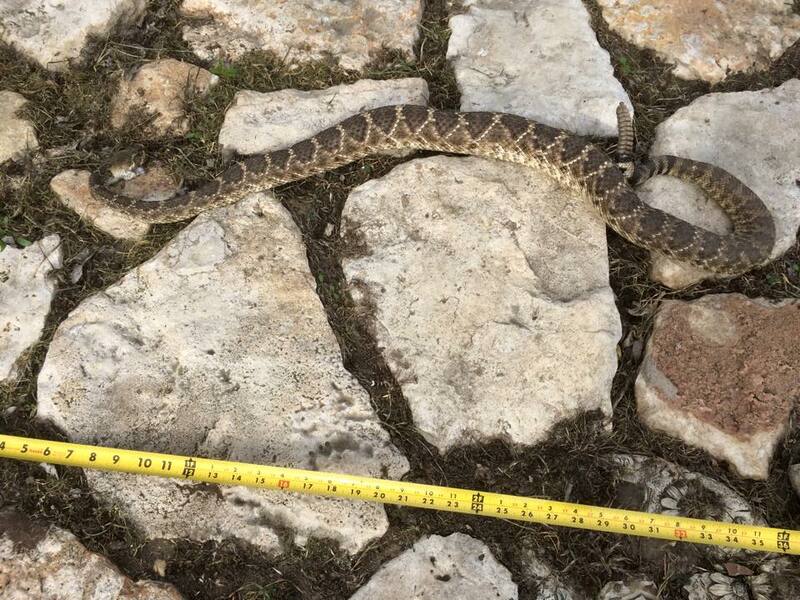 A little one 12″ long with one rattler in February and one last week that had 7 rattlers. It was a little over 2′ long. The longest rattlesnake was last year about 3 feet long. I don’t remember how many rattlers though. my dogs seem to find them first. I have had three dogs bit. One dog has been bitten twice. Last week was his second time. All of the bites have been in the face and they have survived the bites. Thanks to Dr. Graef in Taylor. I do believe this is going to be the worst year yet. Be careful and watch where you step.